According to Catholic tradition, the site where Jesus leaped from the hill after chased away from the synagogue. Luke 4, 29-30: "...and led him unto the brow of the hill whereon their city was built, that they might cast him down headlong. 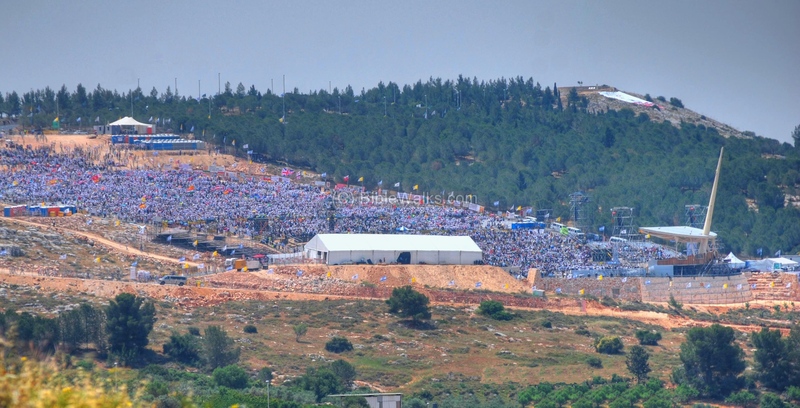 But he passing through the midst of them went his way"
The site is located south of Nazareth, on the cliffs of Mt Kedumim (397M), overlooking the Yizrael Valley and Mount Tabor. Mt Precipice is reached by car following the signs of "Mt Precipice" on the highway that bypasses Nazareth towards Jewish Natzeret Illit. On the western slopes of the mountain, in a cave, a large prehistoric settlement was excavated. The archaeological dig unearthed 18 layers. The famous findings was 13 Neanderthal Skeletons from more than 50,000 year ago. The cave was also used reused in the 6th C by a group of solitary monks. The cave is not open to the public. 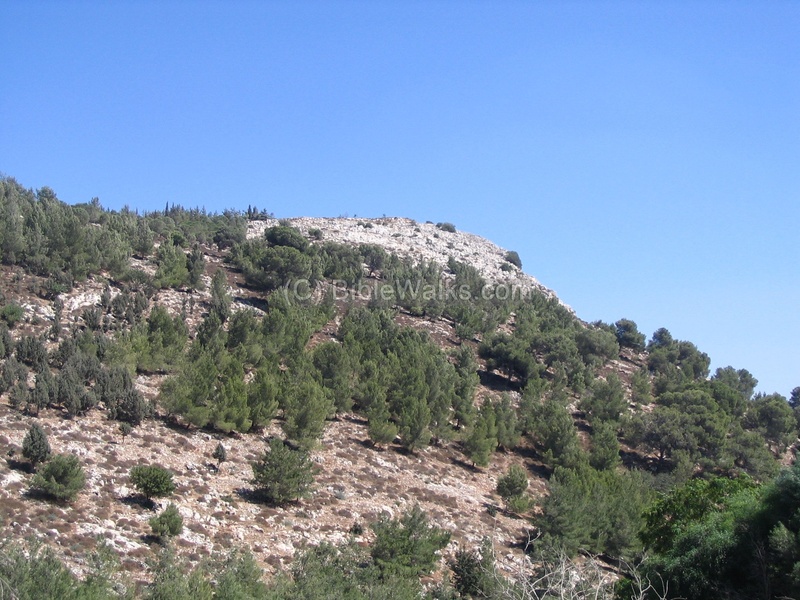 On the peak of the hill is a series of tombs, cisterns, and a 6Mx 10M mosaic was found. In another cave there was an ancient altar. A visit to the top of the cliff is worth while due to the fantastic views of the Yizrael valley (vallée de Jezreel) below. 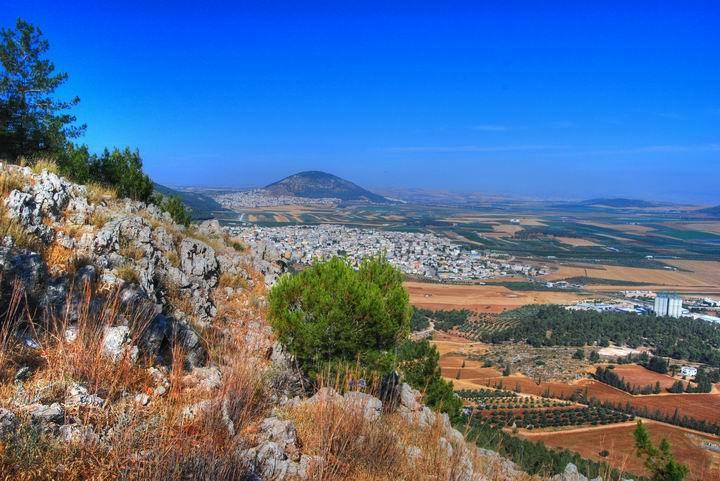 It is spectacular sights of the valley, Afula, Mount Tabor, and more. In the photo below - a view towards the east - you can see the round shaped Mount Tabor in the background and the depression of the Sea of Galiliee to the right of it. Closer - the Arab village of Iksal (the village maybe referred in Joshua 19: 12 as "Chisloth-tabor"). 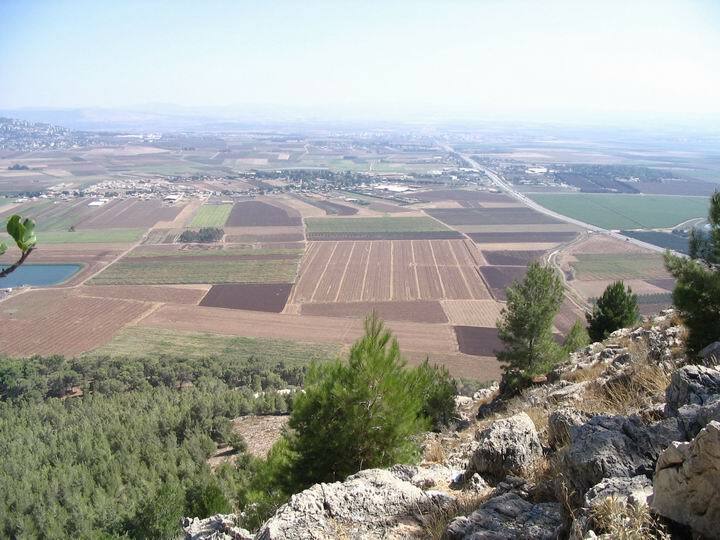 A view to the south shows the city of Afula (in the background) and the Moshav of Tel-Adashim in the foreground. The west side of the hill faces the old city of Nazareth. Just before arriving to the top of the hill is a parking area where you could stop and catch the panoramic views of Nazareth. On May 2009 Pope Benedict XVI visited the Holy Land sites and came for one day to Nazareth - where "it all started". The Pope held a large public mass on the western slopes of Mt Precipice. A new outdoor amphitheater was constructed for this event to support the 40,000 people who attended the celebration. The photo below shows the event on the slopes of the mountain. The Pope's seat was located on the lower slopes, seen here on the right side, just below the bald peak of the hill where a large poster was placed. This story tells about how angry Jewish worshippers drove Jesus away from the Synagogue, attempted to throw him of the cliffs, and he disappeared before their eyes "in the midst of them". "And he came to Nazareth, where he had been brought up: and, as his custom was, he went into the synagogue on the Sabbath day, and stood up for to read. And there was delivered unto him the book of the prophet Esaias. And when he had opened the book, he found the place where it was written, The Spirit of the Lord is upon me, because he hath anointed me to preach the gospel to the poor; he hath sent me to heal the brokenhearted, to preach deliverance to the captives, and recovering of sight to the blind, to set at liberty them that are bruised, To preach the acceptable year of the Lord. And he closed the book, and he gave it again to the minister, and sat down. And the eyes of all them that were in the synagogue were fastened on him. And he began to say unto them, This day is this scripture fulfilled in your ears. And all bare him witness, and wondered at the gracious words which proceeded out of his mouth. And they said, Is not this Joseph's son? And he said unto them, Ye will surely say unto me this proverb, Physician, heal thyself: whatsoever we have heard done in Capernaum, do also here in thy country. And he said, Verily I say unto you, No prophet is accepted in his own country. But I tell you of a truth, many widows were in Israel in the days of Elias, when the heaven was shut up three years and six months, when great famine was throughout all the land; But unto none of them was Elias sent, save unto Sarepta, a city of Sidon, unto a woman that was a widow. And many lepers were in Israel in the time of Eliseus the prophet; and none of them was cleansed, saving Naaman the Syrian. And all they in the synagogue, when they heard these things, were filled with wrath, And rose up, and thrust him out of the city, and led him unto the brow of the hill whereon their city was built, that they might cast him down headlong. But he passing through the midst of them went his way,..."
The Catholic tradition about the site is questioned by many scholars. According to Luke's story the cliffs should be adjacent to Nazareth. 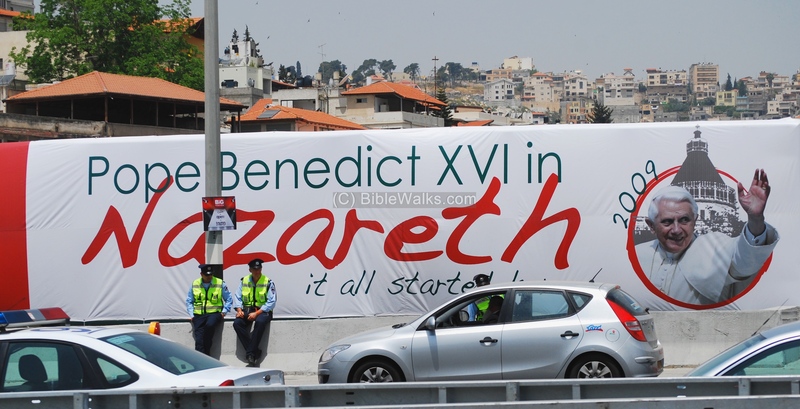 However, they are located 2KM in downtown Nazareth. Therefore, it is more likely that the site should be on the northern slopes of the ancient Nazareth, where the Churches are located today. According to Orthodox Christians the leap was elsewhere: from the Eastern peak of Nazareth hills to the peak of Mt Precipice. Please also check the ruins of a church on the hill north to Mt precipice. This church (Mary's fear, Our Lady of the fright) is called after a tradition that Mary, Mother of Jesus, was standing at this spot when her son was led to the edge of the mountain, about to be thrown away, and was frightened. 18 prehistoric layers of early man dwellings. 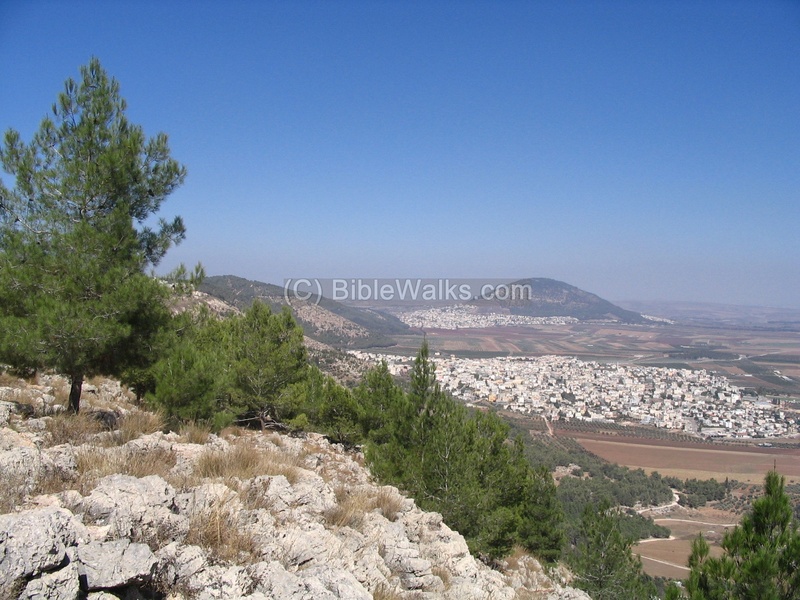 Precipice means in English: "a very steep cliff"
The Hebrew name of the Hill is "Kedumim" or "ancient place" in Hebrew. This name was derived from the pre-historic findings found in the cave on the slopes of the hill. 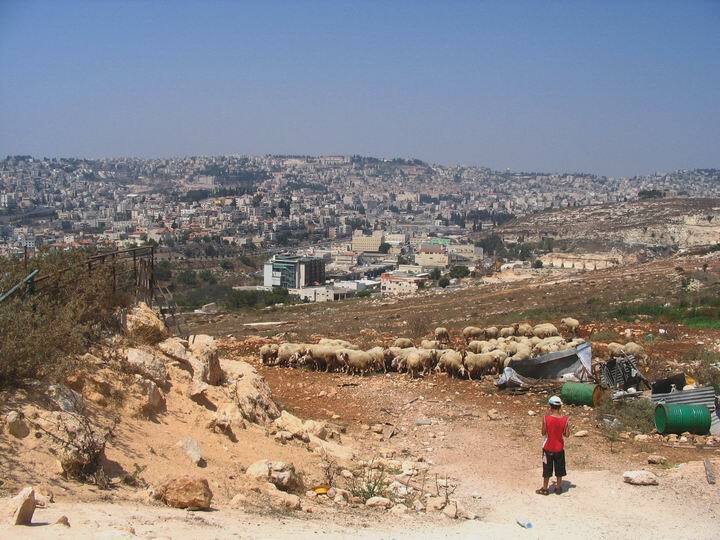 Other Nazareth sites: Nazareth Overview.